Forest chiefs are working to ensure that rare peregrine falcons continue to grace northern skies. 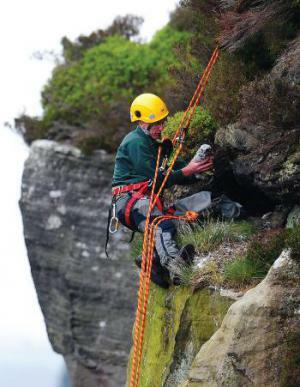 Forestry Commission experts have begun ringing chicks produced by the magnificent creature, which until recently was one of the most persecuted birds in Britain. This year 11 nests are being monitored in 62,000 hectare (155,000 acre) Kielder Forest, Northumberland, most built on rocky ledges, which offer greater protection from potential predators. Back in the 1990s the bird had become so rare that when a pair nested in Kielder a 24-hour security operation was mounted to protect the site. Since then the bird’s revival has been a success story for the Forestry Commission and other conservationists in the region. But many threats remain. Early reports suggest that the stormy weather which struck the region in mid-May has taken its toll. Gales and lashing rain made it almost impossible for adults to hunt for food and some famished new born peregrine chicks perished. Whilst little can be done about the weather, worryingly human predation is also on the increase. Last year three local nests overseen by Martin– although none on Forestry Commission land – were raided, two for their eggs and the other for the chicks, which were taken. Suspicious activity has also been seen around one nest site this spring. This mirrors a national upturn in illegal activity targetting peregrines.